As of 2016, the U.S. is the only developed country without government-mandated paid maternity leave. Additionally, according to research from the Organization for Economic Cooperation and Development (OECD), the U.S. is one of nine OECD countries that have no leave policies for new fathers. In total, there are 36 OECD countries. According to research from the National Institute of Health, children have fewer mental health, developmental and other problems if they have full-time caregivers in the first few weeks and months of infancy. Other research also supports the need for promoting a healthy family environment within our country. After World War II, with many women in the workforce, employers and lawmakers needed to address the issue of pregnancy on the job. In 1972, the Equal Employment Opportunity Commission drafted guidelines that basically labeled pregnancy as a disability. Six years later, the Pregnancy Discrimination Act of 1978 amended the Civil Rights Act that prohibited discrimination on the basis of pregnancy, childbirth or related medical conditions. However, this legislation did not provide time off – paid or unpaid – to care for a child. The Family and Medical Leave Act of 1993 provides unpaid leave. But only about 60 percent of private-sector workers are eligible, as it provides 12 weeks of unpaid, job-protected leave with continued health insurance coverage to attend to a newborn or adopted child, a family member, or an employee’s own serious health condition. There are strict eligibility requirements for FMLA, such as needing to have worked at least 1,250 hours for an employer with 50 or more employees during the 12 months before the start of the leave. Employers, for their part, have been adding parental-paid leave at their workplaces. According to a Society of Human Resource and Management (SHRM) survey in 2018, 27 percent of U.S. employers offered paid leave in 2018, a very slight increase from the prior year. A 2015 survey by Mercer reported about 25 percent of U.S. employers offered paid-parental leave for employees to bond with a new child, while in 2018, Mercer found this dramatically increased to 40 percent. Mercer also reported that the median number of weeks employers offer to birth parents in their paid leave policies was six weeks, a number similar to their 2015 findings. Most employers who do provide some type of paid maternity leave tend to be larger organizations and is dependent on their given industry. As an example, according to the National Compensation Survey (BLS) in 2016, 37 percent of the finance and insurance sector employers offered paid-family leave, while 10 percent of manufacturing and six percent of leisure and hospitality offer such programs. As mentioned in an earlier blog, we are in the midst of randomly surveying Iowa organizations to learn about the prevalence of various ‘work-life’ benefits in the workplace – which includes paid leave, unpaid leave, and a host of other ‘convenience’ benefits that help assist employees and their family members. Being able to pay for this benefit is a big hinderance for many employers, and yet, according to SHRM, not having these plans in place can cause skilled workers to leave for employers who do offer such plans. Additionally, SHRM estimates that every time an employer loses an employee, it will cost the equivalent of six-to-nine month’s salary to replace and retrain a replacement – and considerably higher for highly-skilled employees. The moral of this story is that employers may be wise to pursue the costs up front by offering paid leave programs. Despite the gridlock in Congress to pass meaningful legislation on basically anything of substance to Americans, there does appear to be some hope that there is bipartisan support for some type of paid-family leave. Iowa’s Senator Joni Ernst, along with Utah Senator Mile Lee (both Republicans), announced last month a bill that would allow new parents to take paid time off for their children. Known as the “Cradle Act,” the bill would allow Americans to draw from their Social Security funds to take time off from work. Two other bills involving paid leave are currently being kicked around. The Working Parents Flexibility Act proposes to create tax-exempt savings accounts which can be used to pay for childcare. This appears to have bipartisan support in the House and is moving to the Senate. The problem with having accounts, similar to Health Savings Accounts (HSAs), is that not everyone can afford to set money aside to pay for this benefit. The other bill, FAMILY Act, proposes offering 12 weeks of partially-paid parental leave to all employees who fall under the protection of the FMLA. Funding would be provided through employer and employee payroll taxes. Five states already have a similar mandate in place: California, New Jersey, Rhode Island, New York and Washington. Again, employers with fewer than 50 employees are not impacted by the FMLA. 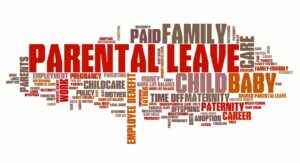 As employers continue to search for opportunities to obtain and retain a highly-valued workforce in the future, paid-family leave programs will be a large trend in the years to come. Balancing competing demands of work and family are important reminders to having healthy and thriving families within our workplaces and communities.